ServiceStack is an independent, self-sufficient, light-weight framework built on top of ASP.NET for building robust end-to-end web applications. In the previous edition of the DNC .NET Magazine (Issue 15th Nov-Dec 2014), we introduced Service Stack and saw how easily one can build web apps and web APIs using this great framework. The same article can also be accessed online over here. ..and we will briefly discuss how to create a self-hosted ServiceStack application. Security is an integral part of any enterprise application. Every framework that allows us to create great apps should also provide ways to secure the app for legitimate users. ServiceStack comes with an easy and effective solution for applying security on its components. In the period of last 2 years or so, OAuth has gotten a lot of attention. We see a number of popular public sites allowing users to authenticate using their existing accounts on Google, Facebook, Twitter or a similar site. ServiceStack offers this to us for free of cost; with minimum setup required to get it up and running. We can write our own custom authentication provider by either implementing ServiceStack.Auth.IAuthProvider interface or by extending ServiceStack.Auth.AuthProvider class. It is also possible to write our own OAuthProvider by extending the class ServiceStack.Auth.OAuthProvider. In the sample application, we will add credentials based authentication and Twitter authentication. Let’s start with credentials authentication. These repositories serve most of the common cases, and you can write your own repository by implementing ServiceStack.Auth.IUserAuthRepository. In the sample application, since we are already using SQL Server for application data; let us use the same database for storing user data. So OrmLiteAuthRepository is our obvious choice. The OrmLiteAuthRepository class is defined in ServiceStack.Server assembly. Let’s add it using NuGet. The OrmLiteAuthRepository instance needs some of tables to work with. As we don’t have the tables already created in our DB, we can ask the repository to create them for us. For this, the repository has a method called DropAndReCreateTables. As the name suggests, it would drop and re-create all the tables. So we need to add a condition to check if one of the tables is already created. This might not be the best possible check, but works for the demo. Now if you run the application and see metadata page of ServiceStack, you should be able to see some new endpoints automatically added for us. Let’s register a user using the endpoint. Open Fiddler or, Chrome’s REST Client plugin or any HTTP debugger of your choice. I am use Fiddler to play with the APIs I build. We will send a POST request to the Register endpoint listed in Figure-2. To know how to use this endpoint, click the JSON link (You can click any of the corresponding links; we will use the JSON endpoint in our app). It shows the options and format of the data to be posted to the endpoint. In your HTTP debugging tool, compose a POST request following the structure in figure 3. Figure 4 shows how to do it in Fiddler. 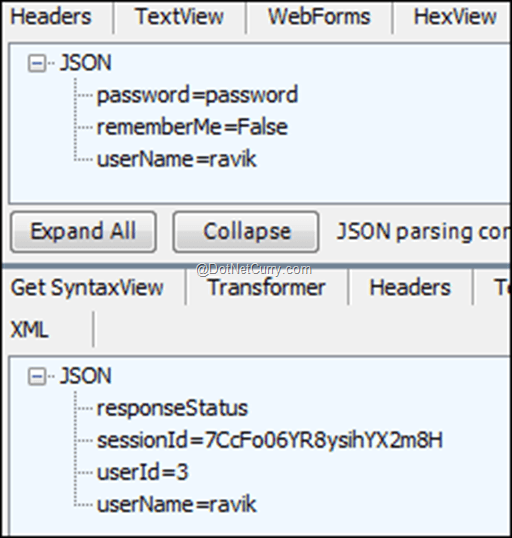 If you set autoLogin to true in the JSON data sent with the request, you would also receive a session ID along with the request. I intentionally didn’t do it so that I can show how to login using the auth API. If your credentials are correct, you will get a success response from server containing session ID. Let’s impose authentication rules on the Marks API. It can be done by simply adding Authenticate attribute to the MarksRequestDto class. Now if you try to load the marks page of any student, you would be redirected to the login page. As we don’t have a view for login yet, the browser will display an error. Let’s add a simple login page to the application. We need a DTO class and a service to respond to the request. Build and run your application after saving these changes. Change the URL to http://localhost:/login. You will see the login page appearing on the screen. Login using the credentials you used to register; it should take you to home page after logging in. And now you should be able to view marks of students as well. Note: I am not creating the register form as part of this article. Creating a register form is similar to the Login form except the fields and API to be used. I am leaving this task as an assignment to the reader. If you click authorize app in the above page, it would take you to the home page and you will be able to access the pages that require authentication. Similarly, you can add any other OAuth provider to authenticate a user. You can learn more about OAuth providers in ServiceStack on their wiki page. This API removes user details from the session. To make it easier, you can add a link on your page. If you login using local account it would display your local username, and if you use an OAuth provider, it would display username of your social account. Login using these credentials and now you should be able to access the marks page. 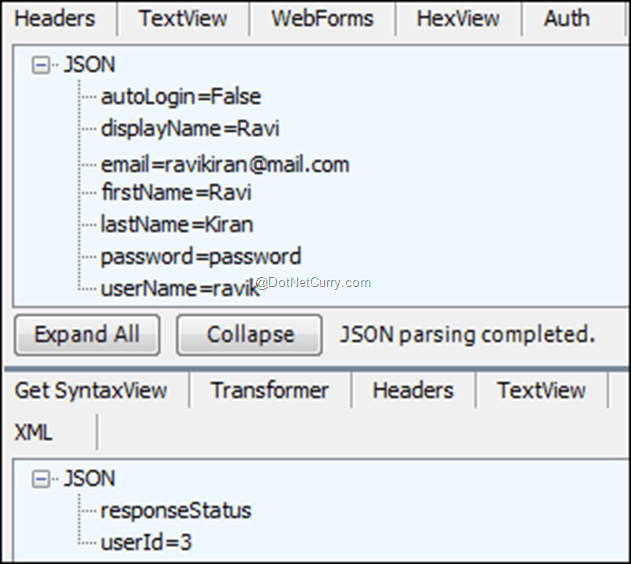 After this step, you will be able to access the marks page when you login using ravi as username. In rich client based applications where you have a lot of client side script to be loaded during page load, loading time of the page gets affected because of number of round trips made to server to load all files. Using techniques like bundling and minification, these files can be combined and shortened to reduce the total size and number of downloads from server to make the page load faster. ServiceStack supports bundling and minification. To enable bundling in the ServiceStack app, we need to install the Bundler Nuget package. The RenderJsBundle extension method is added in Bundler.cs file. You can play around with other options available in the enum BundleOptions by changing in the code and learn its behavior. Markdown is tag less HTML. Meaning, you can compose HTML using plain text by following a set of conventions without writing even a single HTML tag. It is widely used these days to compose README files, post rich text on forums like Stack Overflow and even to write professional blog posts. If you have never tried markdown, check stackedit.io. The welcome page of the site contains a nice example of markdown covering most of the syntax. You can use HTML to apply any formatting that is not available in markdown. This app is to view and manage reports of students of XYZ School. Notice that we are using HTML just for applying bootstrap styles. Content of the page is free from tags. In the last statement, we are using a couple of properties from the model object. We can create a layout page for markdown and use it as base template for all markdown files. It is important to remember that Razor layout pages cannot be combined with markdown views and vice versa. As stated in the first article, ServiceStack can be hosted on IIS, on a standalone application or even on mono. We don’t need to make any significant change in the way we write code to build a self-hosted ServiceStack application. The difference is only in the way we define the AppHost class. The difference between AppHost in web application and Self-hosted application is the base class of AppHost class. Here, we have AppSelfHostBase instead of AppHostBase as the base class. I will leave the Configure method empty here as we are not going to add a lot of logic to this application. You will see a hello message on the browser. As we saw, ServiceStack is an awesome stack of technologies that makes it easier to build and secure an end-to-end application and host it on any platform depending on infrastructure provided by the enterprise. The technology has a number of other features including Logging, Caching, Filters, Validation and support for message queues. Check the official wiki pages for more details on these topics.